Bulgemeister ..... apparently: Raya.... again! 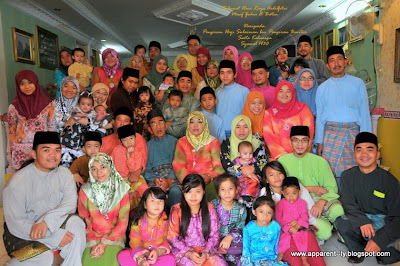 For the first time since Mum passed away, we took a family portrait in the morning of Hari Raya. It was quite a difficult task to get 50-odd people, which included not less than 25 kids, to organise themselves for the picture-taking. Putting the camera on a tripod and getting someone to press the shutter button were not as easy as I thought it would be. This is the best shot that I got.